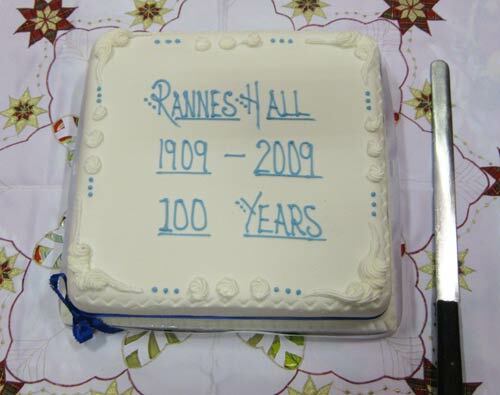 29th December 2009 is the Centenery of the opening of the Rannes Public Hall, Kennethmont. The original proposal to erect a hall for community use was one of many benevolant things Mr Charles Edward Norman Leith-Hay of Rannes and Leith-Hall ( The Laird) set in motion to benefit the tenantry, ratepayers and people living and working on the Leith Hall Estate. Ten years later he would gift Estate land at Insch on which the Insch & District War Memorial Hospital was built. The name " Rannes " is taken from the lands of Andrew Hay at Rannes near Buckie who helped the Leiths of Leith Hall in 1879 on condition they kept his family name alive. He had no family or brothers to carry on the Hay name. Thereafter the Leiths of Leith Hall were known as Leith-Hay of Rannes and Leith Hall. 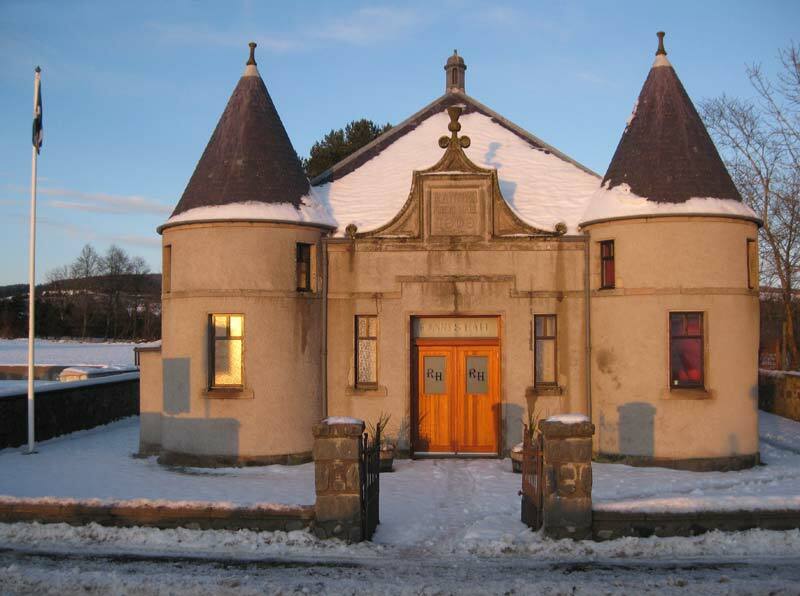 The idea of a Public Hall for Kinnethmont ( Kennethmont) was first proposed by Louisa Henrietta Valdivia O’Neill soon after she arrived here in July 1907 as the Honourable Mrs Leith-Hay of Rannes and Leith Hall, wife of the Laird, Charles Edward Norman Leith-Hay. She was the guiding light, her proposal was taken up by those who went on to form the Building Committee and set her vision into action. Mr Leith–Hay oversaw the building of the hall and it was due to his insistence and genorosity the two fine turrets were included in the plans for the hall. 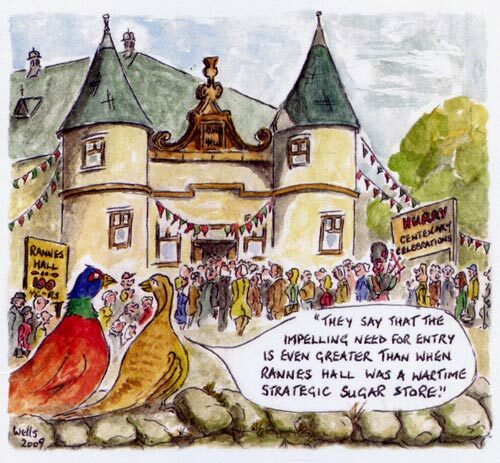 The resemblance to the main entrance at Leith Hall, built by Mr Leith-Hay in 1906, is easily seen. A very successful Bazaar and Fete to raise funds to finance the building of a public hall was held over two days in the grounds at Leith Hall. Much was owed to Mrs and Mrs Leith-Hay, the setting was much admired by all from far, and near, who attended. Mrs Leith-Hay lays the finishing stone of the Rannes Hall. At 3.30 on a sunny afternoon a large crowd gathered at the Rannes Hall to see the finishing stone laid by Mrs Leith-Hay. A crimson draped platform and balustrade, with improvised stairway, had been erected over the entrance from which union flags fluttered in the breeze. The house party from Leith Hall comprised Mr and the Hon. Mrs Leith-Hay, Mr and Mrs George Leith-Hay and their daughter Jean Leith-Hay and Mrs Hirst. 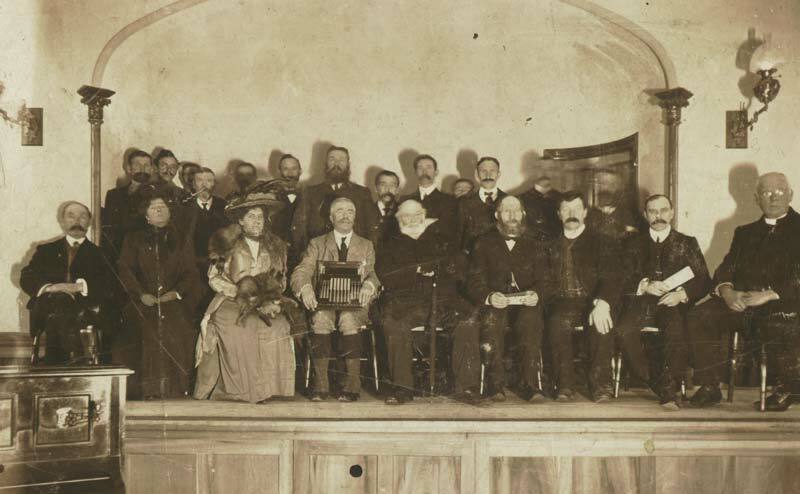 Mr R S Gordon, Tayloch presided and others on the platform were Rev. Thomas Burnett, Parish Church and Messrs. William Stewart, Earlsfield ; John Robertson, Postmaster, Kirkhill ; Albert Smith, I. R. Kennethmont ; Chas. Watson, Estate Office, Leith Hall and Messrs Ritchie and Proctor, masons. Among others present were Mrs Smith, Pittodrie ; Miss Workman, do. ; Miss Collum, do. ; Miss Grant, Drumminor ; Mrs Macdonald, Commercial Bank House, Insch ; Provost and Mrs Dawson and Miss Dawson, N of Scotland Bank House, Insch ; Rev. T Mathieson and Miss Whitton, UFC Manse , Kennethmont ; Mr and Mrs Ironside and Miss Ironside, T & C Bank House, Insch ; Dr Mitchell, Insch ; Mr Walker Bank Agent and party, Huntly ; Mr and Mrs Skinner, Myrtle Cottage, Insch ; Miss Reid, Rothney, Insch ; Mr And Miss Smith, Rosedale, Insch and the Misses Turnbull, Smithston, etc. RS Gordon, Chairman advised the company it was intended to have this event at an earlier stage in the building of the hall but this was delayed due to the prolonged and serious illness of Mrs Leith-Hay. All were delighted to see her here and fully restored to health. He made mention of the difficulties faced by the Committee in raising the necessary funds and that at one point their task seemed hopeless. However, Mr Leith-Hay was kind enough to donate £50 to the fund and they resolved to raise another £60 at a Sale. The Bazaar and Fete at Leith Hall had been a great success. Special mention was made of the farmers from near and far who came to Kennethmont and carted materials without charge to the Committee. Every farm in the local area was involved. Mr Gordon estimated this amounted to 1100 loads of stone, sand and earth. The sand cost nothing, being a present from Mr Leith-Hay and the rubble stones were a present from Mr and Mrs Grant of Craighall. Mrs Leith-Hay then said a few words of thanks before setting the finishing stone in its final position. She was prevented from laying a foundation stone when building commenced due to ill health. The Committee decided they wished her to play a part in the building of the hall and made changes to allow here to be involved in the completion of the building, for which she was most appreciative and delighted to oblige. Mr W Stuart, Earlsfield thanked Mrs Leith-Hay. In appreciation of all that she had done Rev Burnett was asked by the Committee to present a silver commemorative trowel to Mrs Leith-Hay. On accepting it she thanked Rev. 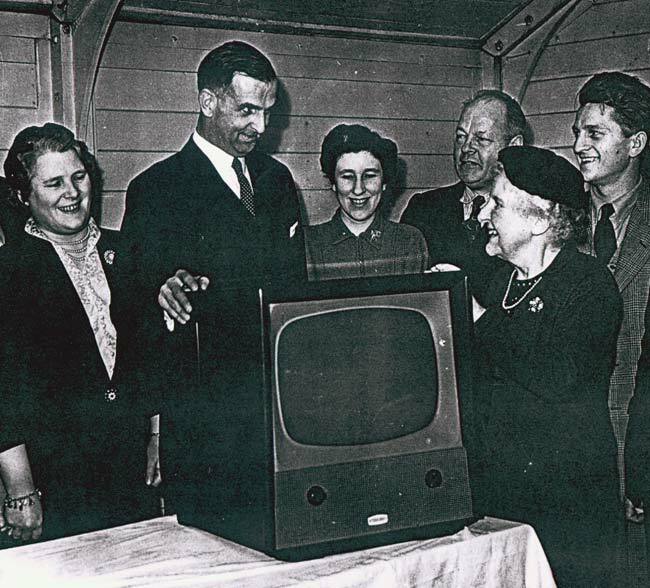 Burnett and the Committee and said that the gift touched her greatly and that she would cherish it always. The trowel was inscribed “Presented to the Hon. Mrs Leith-Hay of Leith Hall on the occasion of laying the finishing-stone of Rannes Public Hall Kennethmont 1909 “. Mr Albert Smith, Inland Revenue officer then presented handsome bracelets to Miss Jean Leith-Hay and her sister, Miss Doreen Leith-Hay. Originally to be opened on 23rd Dec the ceremony was postponed to the 29th due to bad weather. The weather was again particularly wintry in the days leading up to the anniversary 100 years later.
" The history of the hall and its inception can be told in a sentence. It is a lasting memorial to the kindly interest and characteristic generosity of Mr and the Hon. Mrs Leith-Hay, whose example was readily followed by the people amongst whom they live, and who hold them in high regard, which is richly deserved. " At the opening ceremony the Hon. Mrs Leith-Hay was accompanied by Mr Leith-Hay, Mrs Hirst and Mr T. G. Archibald, architect. Mr Archibald made mention that Mrs Leith-Hay had given largely of her time and means, taken a great interest in the fund and importantly getting others interested since the building was proposed until its completion. He added that the honour of opening the hall was well deserved and noted that no one had done more than Mrs Leith-Hay in the furtherance of the scheme. Mrs Leith-Hay then thanked Mr Archibald for his kind words and also the Committee for asking her to perform the ceremony. To loud applause she slid back the doors to open the hall and announced “ I have much pleasure in declaring the Rannes Public Hall open". A large company then flocked into, and filled, the hall. The opening continued on the stage where Mr Leith-Hay presided. He was accompanied by members of the Committee and those involved in building the hall. They were Mrs Hirst ; Rev. T Burnett, the Manse ; Rev. T Mathieson, UFC Manse ; George Cheyne, the Schoolhouse ; Mr A Mitchell, Candy ; Mr R S Gordon, Tayloch ; Charles Watson, Ground Officer, Leith Hall ; John Robertson, Kirkhill ; James Stewart, Mill of Syde; Mr A Wright, Kirkhill ; Alexander Morrison, Wardhouse ; Robert Scott, Broadgate ; A Legge, Kirkhill, members of the Committee. Also present were Mr P F Ironside, North of Scotland and Town and County Bank, Insch ; Mr T G Archibald, Huntly ; Messrs Ritchie and Proctor, builders, Rhynie ; Mr Milton, slater, Huntly ; Mr Shewan, carpenter, Huntly and Mr George Mitchell, painter, Huntly. The 100th psalm was sung after which John Robertson, Kirkhill representing the Committee and ratepayers thanked Mr Leith-Hay at length for all his work in connection with the hall and in doing so recounted his time on the staff of the Under Secretary of State for Scotland and later Private Secretary to Lord Balfour before coming to Leith Hall in 1900. As a token of appreciation a silver gilt set of forks and knives was presented with the following detail on the case in gold – Presented to C E N Leith Hay Esq., at the opening of the Rannes Public Hall, by the ratepayers to mark their respect and appreciation of his great interest in the welfare of the parish – Kennethmont 29th Dec. 1909. Mr Leith-Hay thanks Mr Robertson and the Committee for the gift and the kindly feelings that all had shown for Mrs Leith-Hay since she had accompanied him across from the “ green isle “ to live in their midst nearly two years ago. He proposed a hearty vote of thanks to the Committee and in particular Mr R S Gordon, Chairman, and Mr Cheyne and Mr Mitchell, Joint Secretaries. He also referred to the excellent service rendered by Mr William Joss and Mrs Cheyne, Secretary of the Committee of ladies, who had been of great assistance to Mrs Leith-Hay in carrying out her work in connection with the hall. Mr Cheyne, said in reply that the Committee realised they were working, not only for themselves, but also for coming generations and that what they had done had been in a thoroughly public spirit. Mr R S Gordon proposed a vote of thanks to Mrs Hirst, Lady O’Neill and the ladies who had acted as stallholders and assistants at the very successful bazaar held last August at Leith Hall. Also thanked were the many farmers and others who had assisted with cartage and willing neighbours in Clatt, Leslie, Insch and Huntly who assisted the Building Committee. Mr Alexander Mitchell thanked the contractors, who by their skills and labour, had brought the hall to completion. There followed a successful Sale of Work in the hall which was opened by Mrs Leith-Hay. In the evening a Concert was held which had a crowded attendance, during which Mr Leith Hay sang two solos whilst Mrs Leith-Hay accompanied him on the pianoforte. All the other performers came from Huntly. Some of the detail regarding the opening is condensed from press coverage of the time. The trowel and cutlery set mentioned remain on public display within Leith Hall. The first meeting of the Rannes Hall Management Committee was held on 13 Dec 1909 in the Public School. A Constitution was agreed which detailed the form of the Committee of Management and the running of the Hall. There were to be five permanent Trustees. In addition six Committee members are to be elected to office by the Ratepayers. The Superior of the Parish, and his heirs and successors, to be Convenor. At that meeting a local application to let the hall for a dance on the 30th December was considered, the balance of funds to be handed over to the Building Committee. The application was Granted. Hire rates were set which ranged from 5/- (shillings) to 20/- per function. Today that is 25p and £1. Local societies had a slightly reduced rate. During the past 100 years the hall has been in constant use and a number of changes have been made. Army huts were acquired, and added to the rear of the annexe forming a small hall and kitchen area. It was originally two of the huts erected at Ardmore Distillery during the war when istwas taken over and became Command Supply Depot – Kennethmont. It was used by the WRI, Bridge Club, etc when it’s smaller area was more adequate to their needs. It was eventually replaced in the 1980’s by the small hall with changing rooms, toilets and kitchen area in use today. Presentation on the retiral of Dominie Clark from Kennethmont 1955/1956 in the small hall. On 10th November 1920 a Roll of Honour recording those of the Parish who served, and fell, in the late war was presented by the Kennethmont War Work Association for display in the hall. On behalf of the Hall Committee it was accepted into their care by Mr RS Gordon. In 1938 a curtain to hang across the stage was presented to the hall by Kennethmont W.R.I. and the wall on the west side of the hall was erected at a cost of £29.00. During the last war the Rannes Hall was requisitioned by The Ministry of Food on 13th August 1940 for storage and was filled with 100 tons of flour. Afterwards it was found that the hall floor had been damaged due to the weight upon it. Compensation was sought from the Ministry of Food, who had	the floor replaced. The stage curtains, new only a few years earlier, were slightly damaged by some wartime inhabitants of the hall – mice. The hall was lit by paraffin, later Tilley, lamps up to 1949, the wall fittings for these can still be seen. On 22nd November 1949 it was agreed that the offer of Mr Mackie, Inverurie be accepted and electric light be installed at a cost of £345. An addition cost of £72 was authorised to erect a shed to house the generator plant. 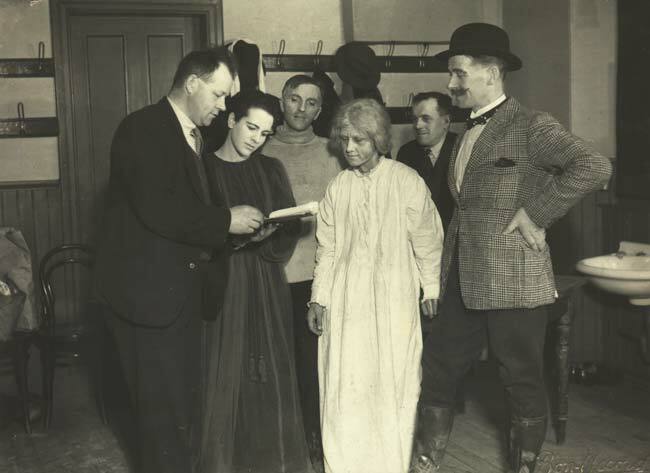 A dress rehearsal of the Kennethmont Amateur Dramatic Society c. 1937. Adam MacGillivray, Rannes Cottage; Wilda Gordon, Muirgreen; ?, Mrs Jean Middleton, Auchlyne; Wm. Reid, Lazyfold; ??. During the late 1940’s and the early 1950’s The Rannes Hall was a popular venue for Saturday night dance with patrons travelling from a wide area of the North East. Buses were run from Huntly and Insch. A Gents toilet was added to side of the hall leading from the cloakroom at the main entrance. Badminton was played in the hall but a slight disadvantage was the balcony and foyer area which meant the court was slightly less than regulation size and play at the rear of the court was affected by the overhang of the balcony. During the 1970’s the balcony and foyer were removed to increase the floor area of the hall. Apart from the removal of the balcony and foyer the main hall has changed little since 1909. In this Centenary year new external doors have been fitted throughout..
Mrs Shona Grant, Mrs Mary Florence, Mr Ron Dawson, Mr Steve Gordon, Mr Ian Pritchard, Mr Stewart Petrie and Mr Wm. Dunbar. 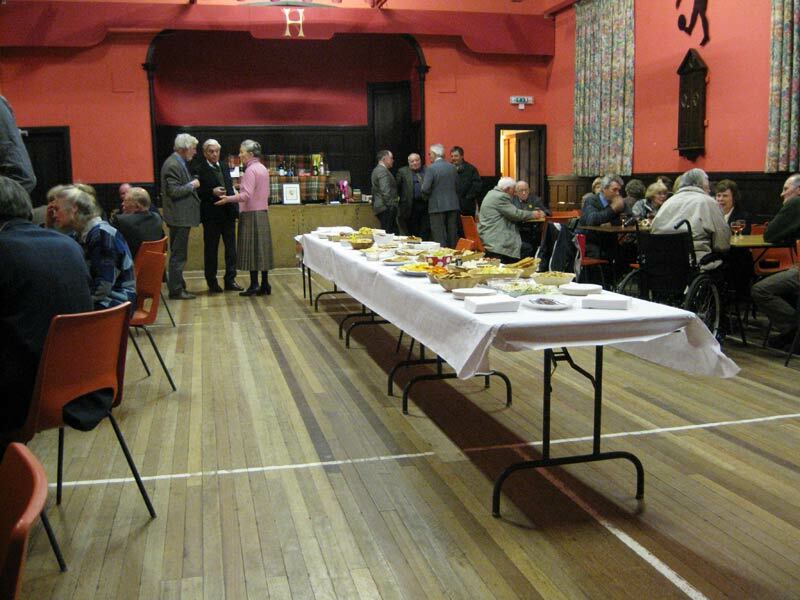 During the first hundred years of the Rannes Public Hall a number of local people have given lengthy service to it as Trustees and Committee members. Among them were Mrs and Mrs Leith-Hay, RS Gordon, Wm. G Gordon, John Porter, Charles Watson, Alexr. Mitchell, George Anderson, Alexr. J Mitchell, Adam MacGillivray, Wm. McKenzie, Sandy McKenzie and John Robertson. At the one hundredth anniversary of the opening of the Rannes Hall he has served it for a total of sixty four of those years. The main entrance of the Rannes Hall. A Cheese and Wine evening was held on Saturday 12th December in the Rannes Hall as the final event of the Centenery celebrations. 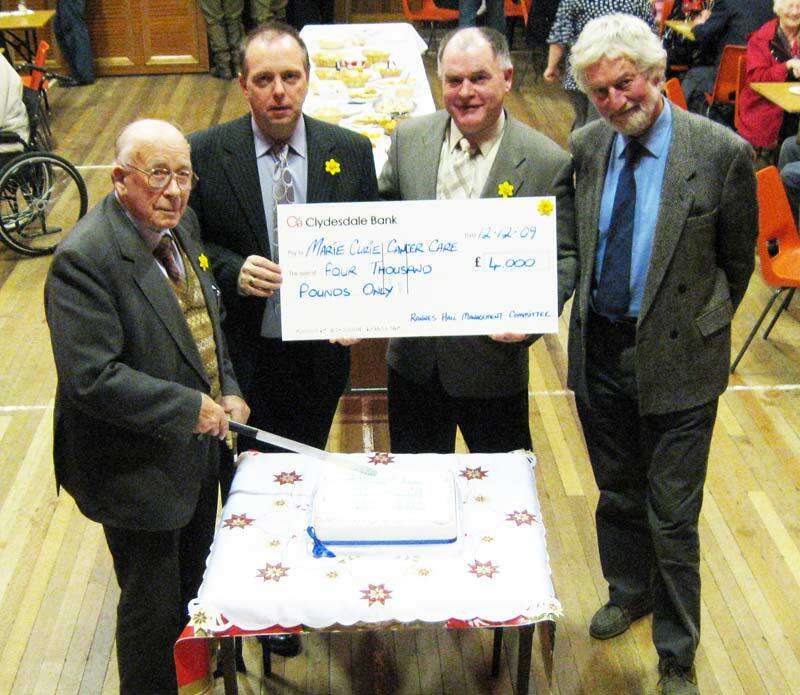 Throughout 2009 various fund raising events have been held including the annual Burn's Supper, a butchery / cooking event, a ceilidh and a very successful Sportsman's Dinner. Due to the latter, a considerable sum was raised, from which the Hall Committee decided to donate a portion to a worthy cause. During the Cheese and Wine evening a cheque in the sum of £4000 was handed over to Marie Curie Cancer Care and accepted on their behalf by fundraiser Michael Jamieson. He was most grateful and thanked all those who had made it possible, pointing out that it would provide two hundred hours of Marie Curie nursing time. Present were James and Charles Proctor, grand-nephews of Willie Proctor, partner in Messrs. Proctor and Ritchie, who built the hall and saw it officially opened on 29th December 1909 by the Rt. Hon. Mrs Leith-Hay. The Committee were also delighted to have Brian Gascoigne with them during the centenery finale. 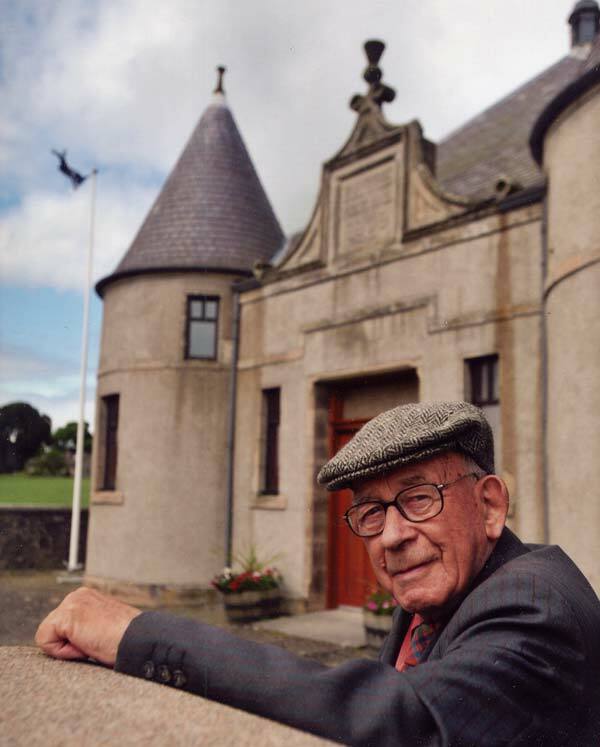 As a descendant of the Leith-Hay family he provides a living link between the Hall Committee and those whose foresight and determination saw the Rannes Public Hall built 100 years earlier, namely Mr C.E.N. Leith-Hay and the Rt. Hon. Mrs Leith-Hay of Rannes and Leith-Hall. Mr Leith-Hay was the first Chairman of the Rannes Public Hall Committeee. Mr Gascoigne is one of only two Honorary Officials appointed since 1909. 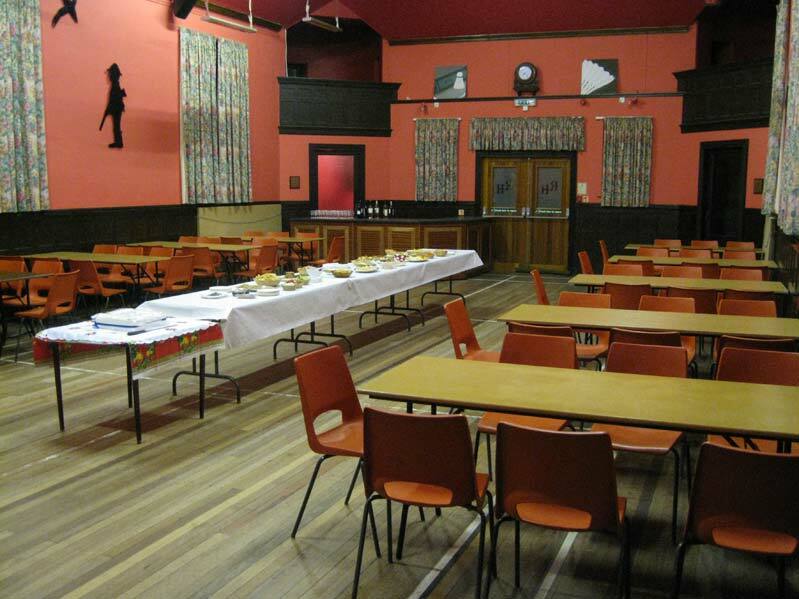 The hall laid out for the Cheese and Wine Evening. Cutting the 100 year birthday cake. Hon. Chairman Jas. F Grant, Michael Jamieson of Marie Curie Cancer Care, Chairman David Grant, Hon. President Brian Gascoigne. An excellent spread was laid on by the Commitee members. 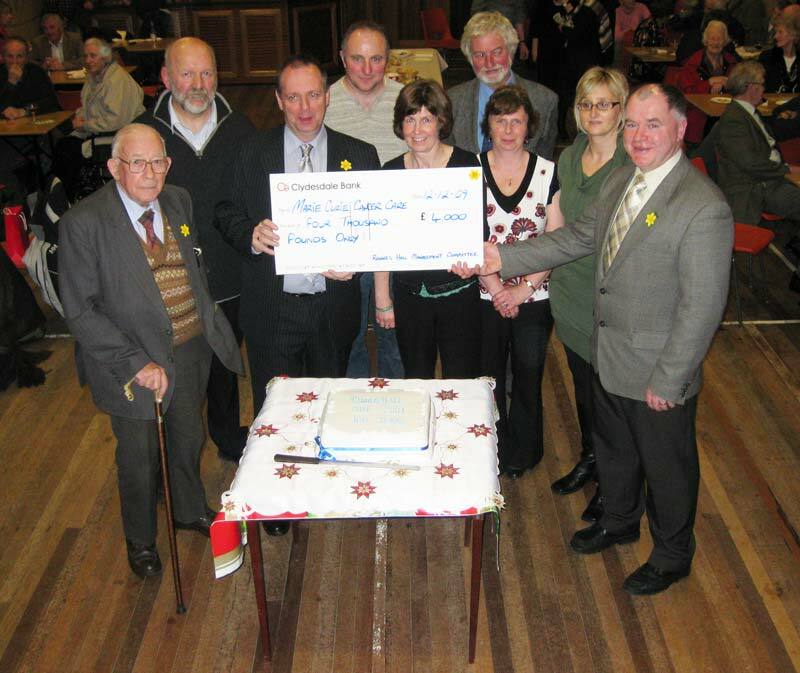 Members of the Rannes Hall Management Committee present the Marie Curie cheque.